Who: Anyone! 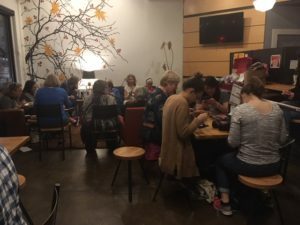 Seasoned knitters, novice knitters, ex-knitters, future knitters, sometime knitters, skilled or un-skilled. What you don’t know, we will teach! If you have yarn and needles, please bring some for yourself and some to share. Jody Grage is leading this group to knit simple hats and scarves for community members who do not have a warm home. Jody will teach easy, pretty patterns and walk you through your project. Typically on the third Tuesday of the month. Questions? Email or call Jody at 206-718-1529.